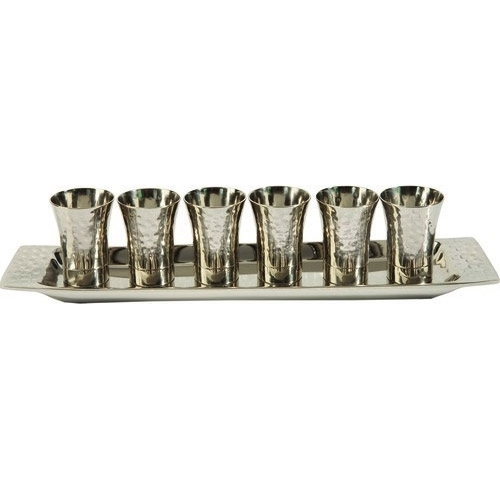 Yair Emanuel's exquisite collection of 6 Kiddush cups of hammered nickel. Your guests will be delighted to pass around Kiddush wine with these beautifully designed cups! 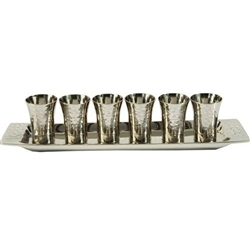 These 6 Kiddush cups are the perfect way to share holiday joy at your Shabbat or Yom Tov table. The base of the cups are decorated in rainbow colored nickel. The set of cups comes with a matching tray. The nickel plated metal cups and tray are hammered by hand. The anodized aluminum ensures that this waterproof cup can be washed without worry.